the fact remains the same, it is a Thrash Metal band, and I believe that when you get to know them close enough, you will notice that they are actually good at what they do. I give you TANTARA, emerging from Vestfold. Not their first time in our magazine, actually their debut album received its fair share of positivity years back. Six years afterwards, and I get to chop their new baby up, titled “Sum Of Forces”, once again released via their local Indie Recordings. Late 80s / early 90s blood driven Thrash Metal is running through their veins, mostly American oriented, Bay Area to be exact but with extras, yet with a slight blink towards the European grandeur. 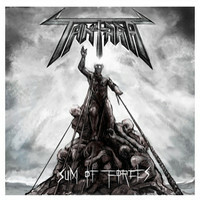 Throughout “Sum Of Forces” it is possible to notice that TANTARA have a lot of prove with their varying songwriting style, while tending to their music with a lot of thought and care. These guys don’t just bash and kick things around, expecting you to fall in line in the moshpit, appreciation of their level of playing and artistic nature are also factors to be taken into account. Keeping it heavy and blasting with classier type of riffing and skull cracking rhythm section al’a late 80s METALLICA, ANTHRAX, SLAYER and semi Hardcorish nature of NUCLEAR ASSAULT, there is enough space for a higher form of musical intelligence, going technical just to maintain the material fresh and challenging. You might notice strong ties to ANNIHILATOR, MEGADETH and CORONER. Capturing the true late 80s spirituality of the Thrash Metal persuasion, I was caught headbanging hard to “Death Always Win”, getting down and dirty within the onslaught going on. The main riff is no less than crushing, Fredrik Bjerkø blasting the airwaves, barking the lyrics in a higher tone, yet with all due respect, his lead guitarist, Per Semb, did the talking with a wonderful lead guitar work. Nothing catchy, only sheer aggression, a number that made me smile. I can’t remember the last time that I listened to an actual lengthy Thrash oriented instrumental. Being introduced to the closer, “White Noise”, which scales ten minutes, I was intrigued. After a few notes it felt like a recreation of METALLICA’s classic instrumental piece, “To Live Is To Die”, traced back to 1988, judging by the main riffery and course of the track, yet I was rapidly out of that notion when TANTARA had their foot on the gas pedal, igniting their motivation for awesome melodies and charring solos. This is a crystal moment in a band’s career, to know how to compose a proper extended instrumental piece that would keep the listener in its radius till its final note is played. “Punish the Punisher”, an attacking opener that will put you into perspective, because something wicked this way comes, determination and conviction in their abilities, TANTARA punishes the posers with hard edge late 80s influenced scorcher. “Sum Of Forces” left me with a strong belief that when done right, and by the book, late 80s Thrash Metal could be mustered nowadays without the addition of modern aspects. TANTARA proved themselves as the guys to do it, and I am glad that I was fortunate enough to review them for the first time. Good stuff.